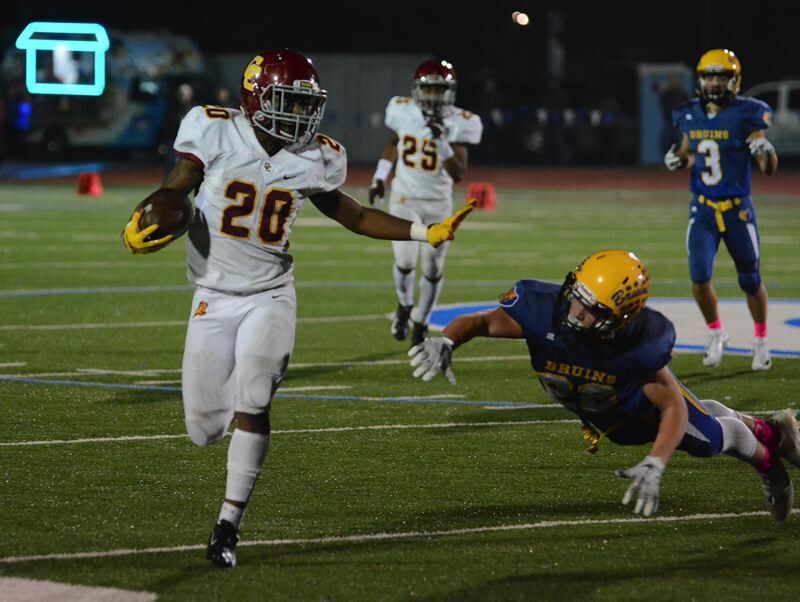 Central Catholic running back Elijah Elliott came up with the two biggest plays of the night in the Rams' 56-42 win over Barlow on Friday, but after the game all he wanted to talk about was a mistake he made in the third quarter. Elliott had a punt slip through his hands near the goal line, which Barlow recovered and turned into points on the next play for a 28-14 lead. "My coaches and teammates kept believing in me and telling me over and over that I could do it," Elliott said. The next time Barlow was forced to punt, it was Elliott again lined up deep to receive the ball. He broke off a couple long returns in the fourth quarter, setting the Rams up with short fields inside the Bruins' 30-yard line. "After muffing that ball, he could have packed it in, but he sure didn't," Central Catholic coach Steve Pyne said. "He came up with some big returns that flipped the field and allowed us to get to the end zone." Important returns indeed, but Elliott's biggest plays were still ahead. His last long return ended with running back Miles Jackson going in front 6 yards out to give the Rams their first lead of the second half 41-35 with 4:19 to play. 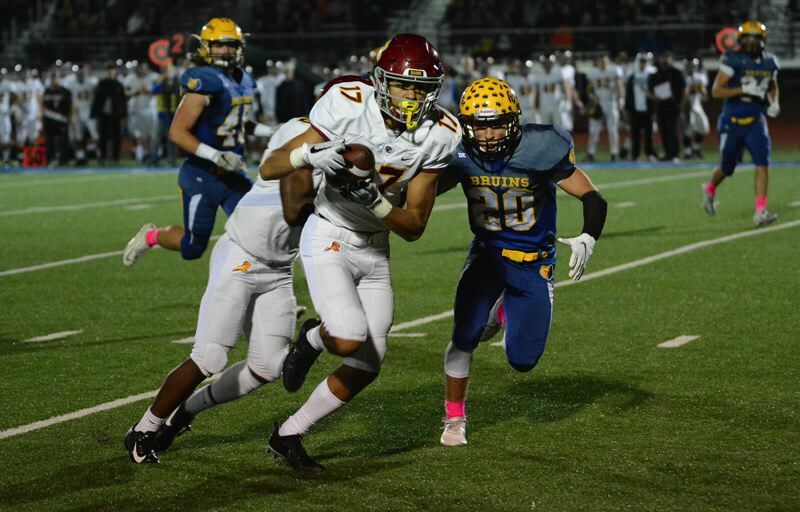 Barlow responded with an 80-yard touchdown drive that ended with Jobi Malary finding a seam over the left side to go 34 yards to the end zone — his fourth touchdown of the night. Bruins' sophomore soccer player Abi Hoffman booted the extra point, and Barlow had the lead 42-41 with 2:30 left. On the next snap, he took the hand off, zipped through a hole over the left side and jetted the final 65 yards to the end zone for the winning score. "Our O-line dominated up front and opened up a big hole, then I got another block from Silas (Starr) along the sideline and went up the sideline," Elliott said. "I was thankful to be able to help the team out." Barlow's final drive reached midfield before running into fourth-and-12. Bruins' QB Jaren Hunter escaped the pocket under a heavy rush to buy some extra time before firing a throw over the middle toward the marker. "I saw the route, peeked in at the quarterback, picked off the pass and ran it to the end zone," Elliott said. 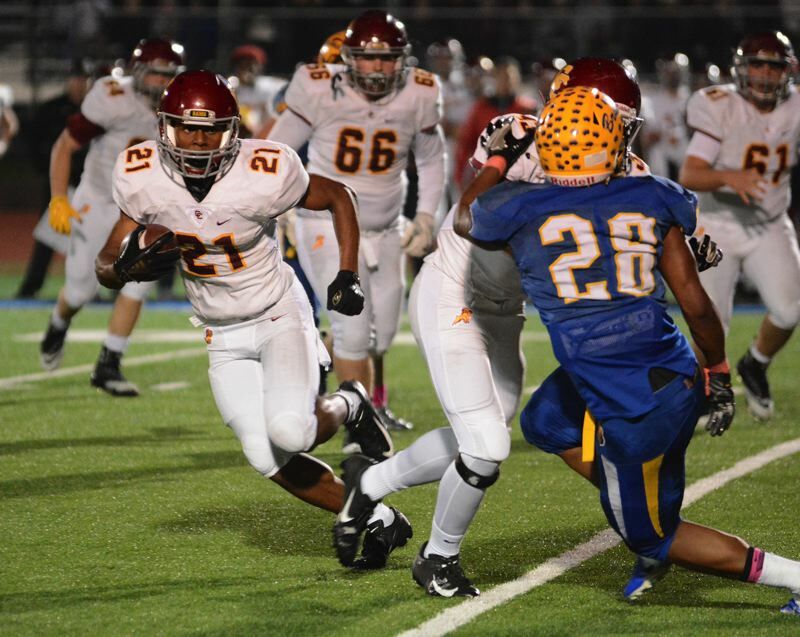 The Central Catholic junior took the interception 60 yards for the final points of the game. Central Catholic (5-3) jumped six spots in the OSAA rankings to make their first appearance in the top 10 this season, sitting at No. 7 heading into the Mount Hood Conference championship game against No. 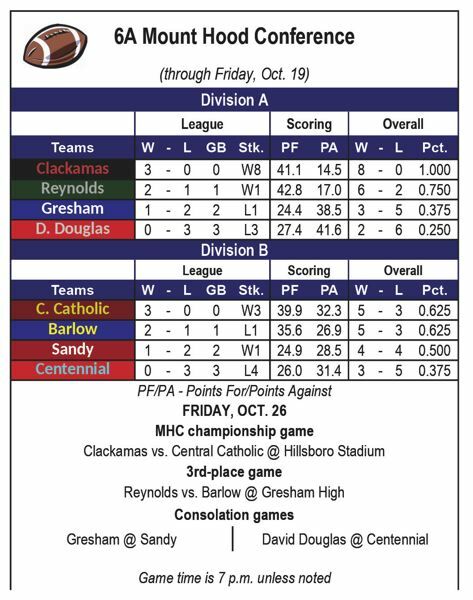 2 Clackamas at 7 p.m. Friday at Hillsboro Stadium. Barlow (5-3) takes on Reynolds in the third-place game at 7 p.m. at Gresham High's Stapleton Field with the winner claiming the league's last automatic spot into the 6A playoffs. Look for expanded coverage ahead in our Tuesday, Oct. 23, print edition.